Today we released a few updates to Timetastic, a kind of Christmas present to our customers! A few are just tweaks to help improve usability, but one is a significant step in making Timetastic more flexible. 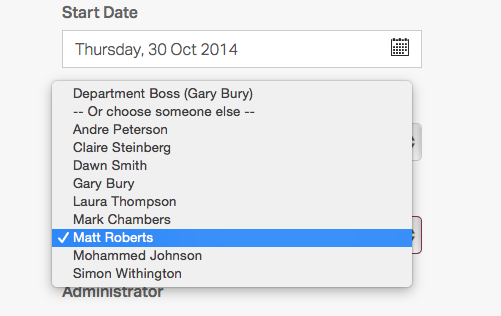 This is the significant one: You can now specify exactly who you want to approve an employee's leave. Until now it was the department boss who approved leave, now you can select away from the department boss in favour of any other Timetastic user. You make the change for each employee in the "Users" section. Go to "Users" from the main menu, select the user and you'll find the new field, "Approver". We know of many customers who group managers into their own specific department so that a more senior member of staff can aprove their leave, but the problem is this department of managers served no real purpose and actually split managers from their department. This is no longer necessary, you can have a department boss whose leave is approved by a more senior person without needing a completely seperate department. You can also us the flexability to operate less formal structures for approving time off, you don't need to stick to the traditional departmental basis. This one has cropped up so many times we lost count, so yeas you can now amend Days in Lieu - both up and down! Sort Order on The Wallchart - when showing all departments the wallchart is now sorted by department and then alphabetically by staff member. Fixed Bank Holidays on ical Feeds. Fixed Status field on Excel Exports. Various copy changes and minor improvements.